The species is widespread in most of Britain. It is widely distributed in western and central Europe. 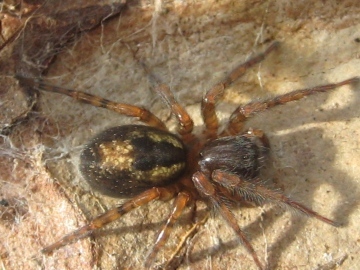 The spider is found in woodlands under the bark of trees, logs and in leaf litter. It is also found under stones and on plants with stiff dense foliage e.g. conifer hedges (Roberts 1995). Webs are very common on tree trunks, in crevices and under loose bark, and are much more easily found than the spider. Although not usually associated with houses and gardens, it is sometimes found on fences. Adults occur throughout the year but mainly in the spring and autumn. Roberts, M.J. 1995. Spiders of Britain & Northern Europe. London: HarperCollins. Account last edited by Geoff Oxford at 15:22 on Thu 14th Jun 2018.